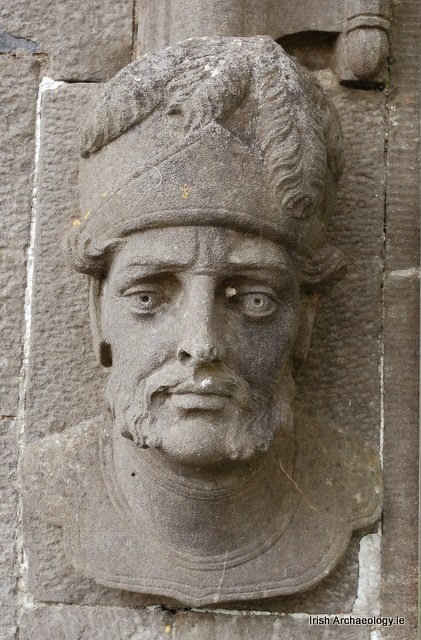 I have been exploring the connection between the ancient Kushites and the Kushan (Kuşāņa) of Bactria and China. There are linguistic connections and similar culture traits. One trait that they have in common is cranial deformation. The practice of cranial deformation is found among Nilotic peoples and in Bactria and Sogdiana among the Kushan. The earliest Kushan dynasty about which we have information dates to 5 BC - 50 A.D. (For lists of the Kushan rulers go here.) The Kushan split into northern and southern empires around 330 A.D. The Kushites and the Kushan were great pyramid builders. Pyramids have been found from Niger to Bosnia and China. Their religious beliefs parallel those of the rulers of the Afro-Asiatic Dominion. They share a religious tradition that includes ancestor veneration, henotheism, and belief in the divine appointment of rulers. Additionally, the Kushan have a priest caste, practice animal sacrifice, and venerate of the Sun. 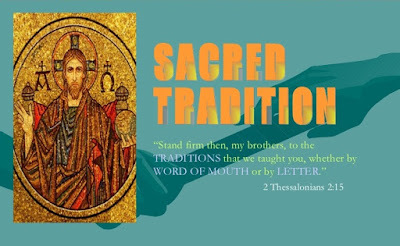 The commonality is due to the way these religions developed organically from the archaic religion spread by the ruler-priests who are called "the mighty men of old" in Genesis 6:4. The so-called "Ur-David" mummy (1900 BC) was found here. He was tall and had red hair. The Kushite and the Kushan both mummified their rulers. There are definite similarities in clothing, facial appearance, skin tone, and religious practices among the Kushan-Yuetzhi and the Nilotic Ainu. 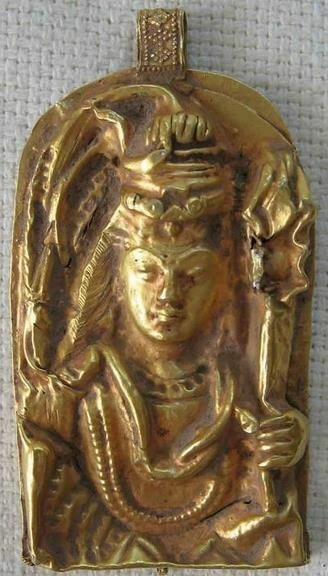 The gold medallion belts found at Kushan graves are similar to the roundel belts depicted on statues of ruler-priests found within the temple complex at Hatra between the Tigris and Euphrates. The rulers of Hatra controlled commerce that moved through their territory along the two main caravan routes that connected Mesopotamia with Syria and Asia Minor. The principle deity was Shamash whose emblem was the Sun. Shamash means "throne of the Sun" in Arabic. This is the same deity as Ra who overshadowed Hathor-Meri. She became pregnant and gave birth to Horus. The rulers of Edom were devotees of Horus (Horites). The Edomites are associated with the color red (edom means red). Probably some had red hair and a reddish skin tone. This is the Biblical description of Isaac's son Esau who was born red and hairy. Esau the Younger married a Horite woman of Edom, a descendant of Seir the Horite (Gen. 36). There are many connections between Japanese and African words. For example, the name Isahi appears to be a variant of Esau or Issa. Kishi appears to be a variant of Kish and Kush. Obito, the title for a regional chief in Japan, is related to the Edo (Africa)/Edomite (Southern Arabia) word for chief, which is Oba. The first ruler of Petra was the Horite ruler Obodas. These ancient rulers were said to have a reddish skin tone (as was the case with Esau and David). The ancient Greeks called Edom "Idumea" which means "land of red people." The original name of Tokyo was Edo. 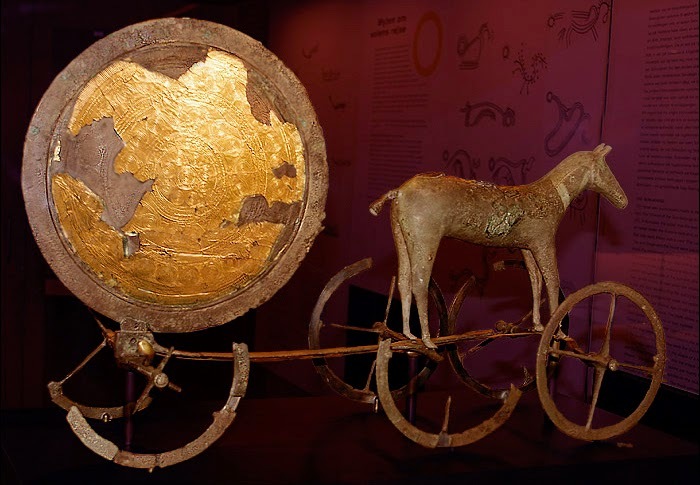 It is believed that the Saka moved into Ireland and the British Isles bringing with them iron work, horses, and their religious beliefs which centered on a supreme creator God whose emblem was the Sun. The prevalence of solar imagery in the ancient world is evident in the study of sacred texts. Psalm 92:2 describes the Lord as “a sun and a shield.” The Victory Tablet of Amenhotep III describes Horus as “The Good God, Golden [Horus/Her], Shining in the chariot, like the rising of the sun; great in strength, strong in might…” (Tablet of Victory of Amenhotep III, J.H. Breasted, Ancient Records of Egypt, Part Two, p. 854). Early Bronze Age, c. 1400 B.C. This beautiful artifact was found in a bog in Denmark in 1902. It is made of bronze, an alloy of copper and tin, but to gain the tin the craftsman had to trade with metal workers from as far south as Spain. The ancient tin route ran from Spain through Cornwall, England and Ireland to Denmark, the Scandinavian Peninsula, and Finland. The Kushan are regarded as the founders of Peshawar, then called Purushapura. 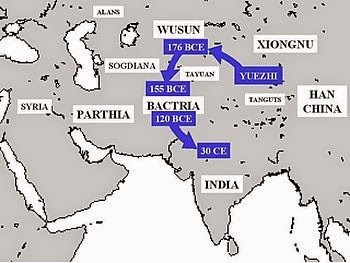 The Yuezhi conquered Bactria in the 2nd century BC. According to the Matsya, an ancient book from India, the world belonged to the Kushite Saka (Sacae/Saxon) for 7000 years. There is DNA evidence to confirm the Kushite migration out of Africa. The Kushan-Yuezhi provide evidence of the perhaps the most recent movement of the Kushites out of Africa. Some moved into central Asia and China and others moved into Japan. They are also called Gurjar. Gurjar is a reference to their mercantilism and metal work. In Akkadian gurguri means metalworkers or copper smiths. In Oromo gurguru means to sell (gurgurtaa = sale, gurguraa = seller). In Somali gur- refers to collecting something and gurgure means one who collects and keeps collecting. The Gurgure clan of the Dir refers to traders who collect wares and resale them. Among the Dir guri means stick, rod or firearm. Bulghar means "territory of the Ghar." The Kushan-Yuezhi called themselves Visha or the Vijaya. This is usually rendered "tribes" although the word refers to their two ruling royal houses, as in vijana, the splitting of wisdom. The honorific title Pharaoh originates in the term pr-aa, which means "great house." In Vedic tradition, pra-jna means "wisdom of the great house." The words have multiple, related meanings (polysemic). In Vedic tradition the a-laya-vijña-na is the seed of the receptacle-world, but literally it means the receptacle of the seed, as in va-gina, symbolized originally by the pictograph V. Karmic seeds - bija - are laid down in Alaya-vi-jña-na to produce karmic fruition. Alaya (aalaya) refers to a house, dwelling, or a receptacle. Bi appears to be a variant of Vi. The Kushite rulers maintained a pattern on intermarriage between two ruling lines. We find this pattern in Genesis. The lines of Kain and Seth intermarried. The lines of Ham and Shem intermarried, as did the lines of Abraham and Nahor, and the lines of Amram and Jethro intermarried. This is a distinctive feature of the marriage pattern of the Nilotic Ainu and their Edomite kinsmen whose rulers are listed in Genesis 36. This marriage pattern preserved their genetic type and the distinctive hairy face and red skin tone. In Genesis Esau of Edom is described as hairy and red. There is a mistaken idea that all the peoples who moved out of Africa were black. However, among Abraham's Nilotic ancestors there was a range of skin color and appearance. To this day, Africa has the greatest genetic diversity of any continent. 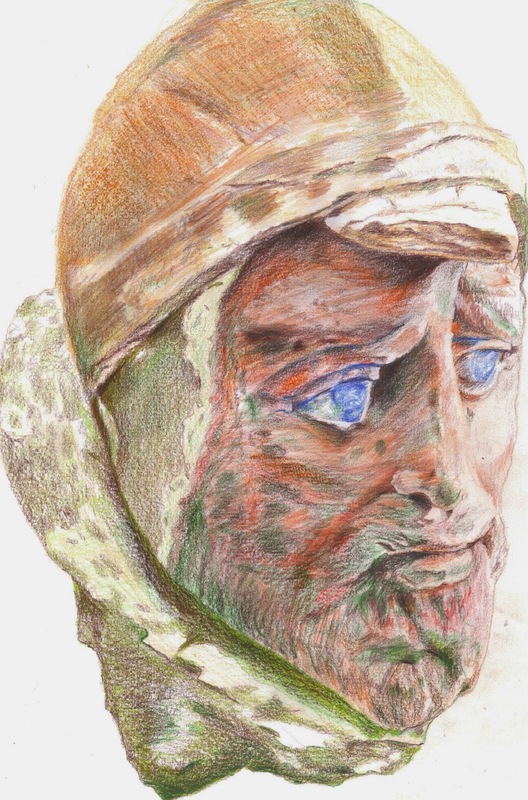 The facial structure of the Kushan and Ainu is also similar, as is seen in the following images. Common features include high cheekbones, an aquiline long nose, full lips and a beard and moustache. The beard is often ginger colored or dark brown with reddish highlights. Ancient Chinese sources describe the existence of "white people with long hair" called the Bai people in the Shan Hai Jing. The range of territory ruled by the Kushites makes it a challenge to discover cognates. Consider, for example, the words Kanishka and Jianisejia. These would not be readily recognized as cognates. Likewise, few historians recognize that a variant of Kushan-Yuezhi is Gueis-Huang. Clearly there is a need for further study to uncover the linguistic dispersion of the Kushites. Linguistic similarities have been noted. The Ainu and Han scripts, for example, are variations of an older Kushite script. Kushan rulers spoke a Saka language. The Khotanese Saka language is found among the Tarim Mummies. János Harmatta pointed out that this language is very similar to the Bactrian language as outlined in his analysis of the Dasht-e-Nawur inscriptions. Sa-ka and Ainu are both archaic words for Human Being. The Ka was believed to be the essence of the person received from the mother. This is also the root of the honorific title Kain, Qayan or Khan, meaning king. This resembles the Old Nubian ko meaning master and the Meriotic honorific qo, meaning noble or ruler. Variants include Xan, Han, Ke-Han, and the Mongolian Qaan. Eve gave birth to Kain/Cain and said "ka-niti" which is related to the ancient Egyptian ka-ntr, meaning "spirit or essence of a king." The ancient Nilotes believed that the Ka was received from the mother and the Ba from the father. Linguist Penelope Aubin notes, "In language history, it is not uncommon for the outermost reaches of a language's range to preserve archaic features long after the original language (spoken and written) has undergone considerable change. Icelandic's relation to Old Norse and Old Irish's relation to early Celtic are examples." This appears to be the case with the words priest and water. In ancient Egyptian tera-ntr refers to a ruler-priest and among the Ainu tera means priest. The Ainu word for water is aka, which corresponds to asta, the Old Nubian word for water. Aubin notes a linguistic connection between Aramaic and the script used by the Kushana. She writes, "Kharosthi, closely related to Brahmi, another of the rare alphasyllabaries mentioned earlier, was a script used in western India beginning around 500 B.C.E. under the Maurya emperor Asoka; it continued under the Kushana dynasty until the 4th century C.E. It appears on both Persian sigloi and on Indo-Greek, Indo-Scythian and Indo-Parthian coinage. This script may have been a hybrid of Aramaic, which was introduced by the Persian Achaemenid rulers who conquered Northwest India, and the indigenous Brahmi script, itself possibly inspired by Aramaic. It is sometimes referred to as Indo-Aramaic." There is also a correspondence between place names of sacred sites in Kushan territories and Kushite territories. Karnak, Orissa, On (the root of Onogar) and Borno are examples. The Kushan capital was Hucao at the lower Wakhsh (Oxus) and the Darya-i Pandj (Ochus) river valley towards Aï Khanum. Aï Khanum reflects the Afro-Asiatic words Khan or Kain and Ai. Ai is the name of an ancient shrine in Palestine. Genesis 12: 8 says that Abraham proceeded “to the mountain on the east of Bethel, and pitched his tent, with Bethel on the west and Ai on the east; and there he built an altar to the Lord and called upon the name of the Lord." Here is a provocative linguistic connection between the Ainu of northwest China and the Nilotic Ainu who moved out of Africa. The Ainu of northwest China live in the region of Tian. Tian is also the oldest known name for the Supreme Creator in China. Ti-an means the Most High God of the Ainu. The Ainu of China practice circumcision and animal sacrifice. Their stories of creation and explanations of corruption in Paradise have parallels to the Genesis accounts. There are 125 pyramids and 5 are 3 times higher than the pyramid of Khufu at Giza. The oldest Tarum Mummies found in China date from 1900 B.C. 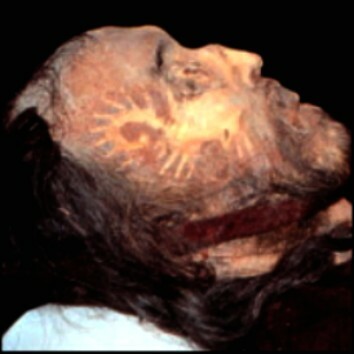 The so-called "Ur-David" mummy (shown below) was tall and had red hair. This mummy, also called Cherchen Man or Chärchän Man, dates to about 1000 B.C. Note the solar mark on this ruler's face. 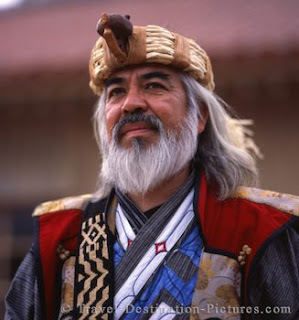 The Ainu of China are described as a "caste of circumcisers." They number approximately 6,500 people. Most live scattered over northwest China in the counties of Hetian, Luopu, Moyu, Shache, Yingjisha, and Shulekuche, near the ancient oasis city of Kashgar. They keep sheep and goats. The Ainu of China experience the same social discrimination and abuse as the Inadan of Niger. The majority of Uygur dislike the Ainu and call them abdal, which means "beggar." Likewise, the dominant Taureg refer to the tent-dwelling Inadan as thieves and beggars. The Inadan keep herds and are responsible for metal work, circumcision, and music at special events. Their chiefs maintain two wives in separate households on a north-south axis, as did Abraham and his forefathers. Inadan men are the only persons permitted to work metals. The Inadan claim to be kin to King David (Aug. 1979, National Geographic, p. 389).